Eating out occasionally can be a nice alternative to cooking at home, but it can also throw your healthy lifestyle for a loop. Restaurant food is often delicious, but can also have hidden health consequences. Here’s the good news – there are healthier choices that you can make while eating out. Whether you’re trying to loose weight, manage high blood pressure or diabetes, follow these guidelines and your body will thank you later. Go healthy…Most restaurants offer healthier, low salt alternatives on their menu. While most of us aren’t willing to order a grilled chicken salad every time we eat out (me included), we can still make small, but important changes. Order vegetables, like broccoli, as your side instead of french fries. Also, take a break from fried fish and choose the ‘grilled’ for a change. You get the picture? These small changes add up. Eat less. Many restaurants serve fairly large portion sizes. Use this to your advantage and share a main dish with a friend or only eat half and take the rest home. A healthier choice, plus you’ll save money at the same time. Here’s another strategy – Since it can be tempting to eat everything on your plate, divide the food in half before you ever begin eating. Just push one half to the side and you’ll be ready when it’s time to ask for a ‘to go’ box. Savor your food. Eat small bites and pay attention to the taste and texture. Chew slowly and thoroughly and try putting your fork down for a while between bites. Staying focused on your food may help you feel satisfied while eating a smaller amount as well. If you find this challenging, make sure to have plenty of interesting conversation planned for dinner. It’s difficult to eat and talk at the same time! This strategy has never let me down. Say no to bread. 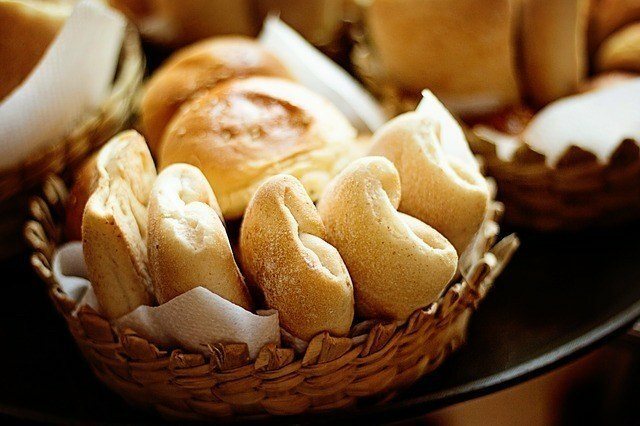 It’s easy to scarf down multiple pieces of bread without even noticing, while you’re waiting for your meal. This can add many calories that you weren’t planning to consume. Want to avoid the temptation altogether? If it’s okay with your friends or family, ask the server not to bring bread to the table, or only to bring one piece for each person. Fruits and veggies are your friends. Try to make fruits and vegetables a significant part of your meal. Choose a side salad as one of your sides (it’s usually a choice). It will help satisfy your hunger, leaving you with leftovers and the yummy ‘to go’ box that I mentioned earlier (as well as a free lunch for the following day). Final tip. Let’s say that you can’t help yourself and you pick the least healthy item on the menu every time. First of all, stop doing that…LOL. Secondly, how about making a deal with yourself to order steamed vegetables as a side. Oh, and not the ones that are sauteed in butter or covered with a heavy sauce. If you enjoyed this article, be sure to share it with my social icon ‘sharing’ buttons at the bottom of the page.